Happy that I still had my fish, I decided to cook some Mahi Mahi for dinner after that incident. I also decided to make my own aioli after making salad dressings and mayo at work all week. The tomato makes this aioli a bit more tart and creates a great sauce for the fish. I also decided to wrap my fish in some of our endless supply of zucchini. If you own a mandolin I suggest you use it to cut very thin slices; otherwise try to cut them as thin as possible while keeping them long, so they can wrap around the edges of the fish. The thin slices get nice a crisp while the fish cooks, giving it an awesome texture. In a food processor or blender, blend the egg yolks, garlic, lemon juice and tomatoes until smooth and a bit foamy. Very slowly, add the olive oil, gradually pouring faster, until a thick aioli forms. Season to taste with salt and pepper. Preheat the oven to 375. Season each filet of fish with garlic powder, then wrap with zucchini slices. Bake at 375 until fish is cooked through (about 15 minutes). Then turn on the broiler and finish cooking until zucchini is crisp (about 5 minutes). 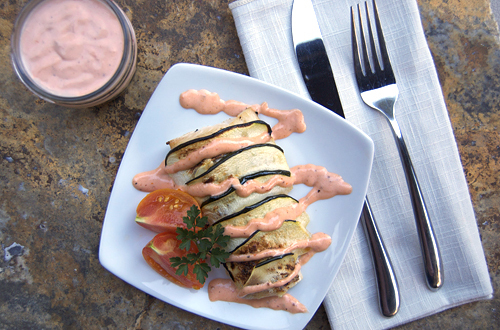 Drizzle with tomato aioli to serve. Ohh wowww, now this is my kind of meal..look amazing Jenny! We keep a lot of our meats and seafood in a chest freezer too, but luckily I’ve yet to have any disasters. So glad to hear most of your stuff was salvageable! Love all the fresh flavours in this recipe. I’ve never added tomato to aioli, but it sounds like a really flavourful topper for that gorgeous fish. Must try this while the zucchini are still plentiful and cheap! sorry for your fridge, this looks amazing recipe.. good job.. Sorry about your freezer. Great recipe. What a lovely dish. What a nice idea to wrap the fillets in zucchini rather than bacon (as we all know, lots of things can be wrapped in bacon). This dish is healthful and sounds delicious. Thanks for sharing such sharp, appetizing photos as well. Great way to use the seasons plenty of zucchini. I bet the fish with the sauce turned out delish! This looks so elegant and delicious! 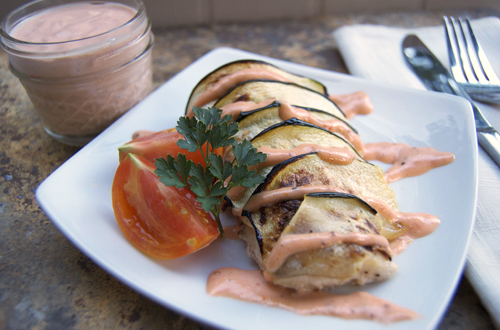 I love the idea to wrap the fish up with zucchini and that tomato aioli sounds fabulous! This looks amazing! So light but still savory and creamy. Fabulous idea! I can’t believe how amazing that sounds! I have to try this!! 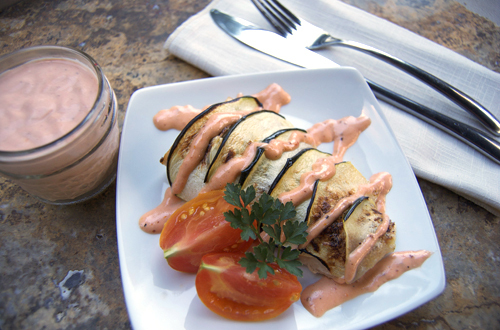 I love the zucchini idea! That looks excellent. Funny you mention the freezer going out. We just lost our power for 33 hours. Lots of melting! Lots of grilling! This looks amazing!! Something I would definitely try out, great recipe! This looks DELISH!!! Great post. What?! Why not? That is nuts.